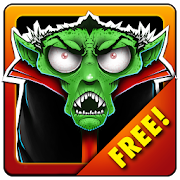 Ghosts vs Zombies is a free arcade game for Android devices. Save Igor before the furious Dracula! Hit the Ghosts and Zombies to avoid the battle. Every battle is a one brain less. If you lose all your brains – you lose a job for Dracula! – Challenge for a time! – Ghosts and Zombies appear faster every second!